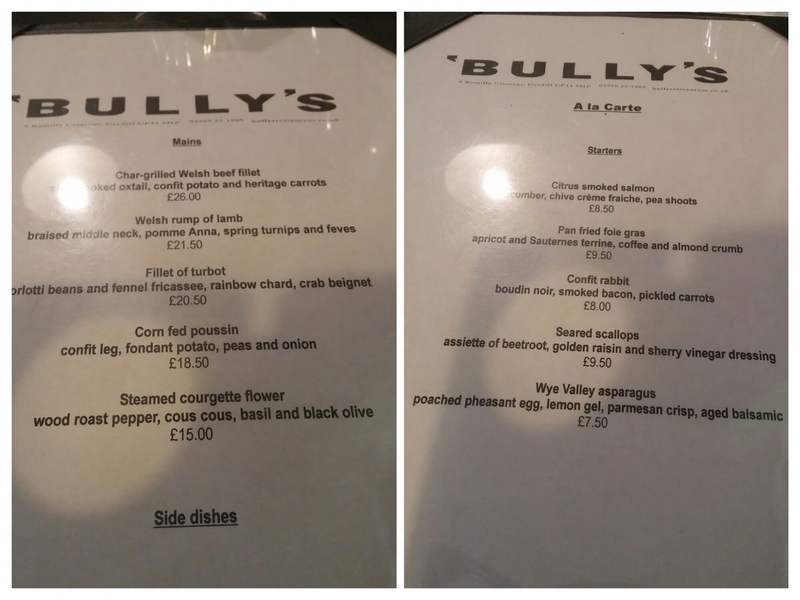 You can’t beat a bit of bully – Bully’s, Cardiff – restaurant review. Regular readers of the blog will know one of my mission with the blog is to highlight what I see as the inequity of mark ups on wine applied by some (not all) restaurants, but what people often forget and many restaurants fail (for perhaps obvious reasons) to highlight is the possibility of circumventing the list totally and bringing your own wine based on corkage being paid. 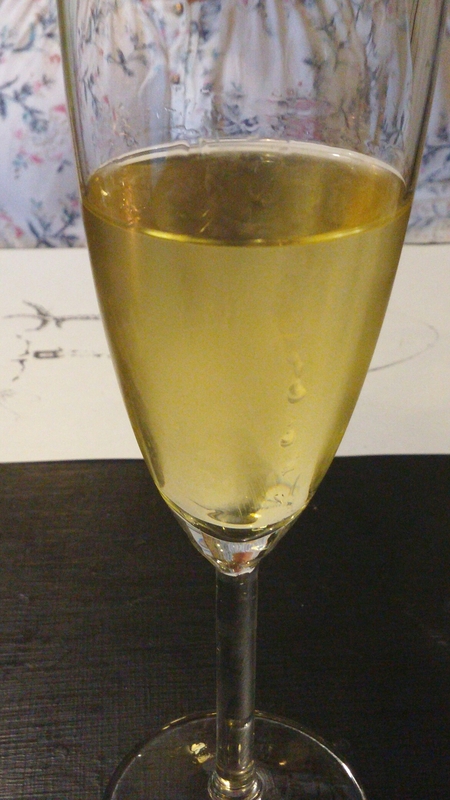 I emailed (a while back) a few restaurants in Cardiff and the surrounding areas (who don’t actively advertise any “bring your own” policy) to enquire as to their “corkage” policy – on the lines of :”Do you have one (i.e. can I bring my own wine rather than have to buy yours) and if so how much will you charge me for the privilege?” Responses ranged from “no we don’t” (Potted Pig and Pier 64), to “yes we do” with the price where they do ranging from £18 a bottle (Chapel 1877) to a much more reasonable £10 (Bully’s and Chez Francis, although the latter was caveated with a “as long as it isn’t rubbish” which is quite subjective – presume rubbish in their eyes rather than the punter’s). It is, perhaps, to many an odd thing to pay someone else for the privilege of drinking your own wine, but in many circumstances in makes perfect sense. If you bring your own you are not restricted to what is on the restaurant list and can bring something you know you like. Also it, more often than not (especially as you move up the price range), makes perfect sense money wise. It is always, mind you, wise to check the menu in advance (if possible) so you can bring a suitable match wine wise and my advice is also check upfront as to what the corkage policy is (places change policies over time) and tell the place on booking if bringing your own wine (unless they overtly advertise fact they have a corkage/BYO policy). Bully’s corkage policy is a very reasonable £10 per bottle, so for a meal to celebrate my birthday (as I get older I feel less and less inclined to celebrate – especially after being asked on my birthday of all days by a charmer in B&Q if I had an over 60s discount card when I am in my forties – in the little blighter’s defence I was at the time walking with a stick due to a broken foot, which I was sorely tempted to use to cause his premature death!!!!!) 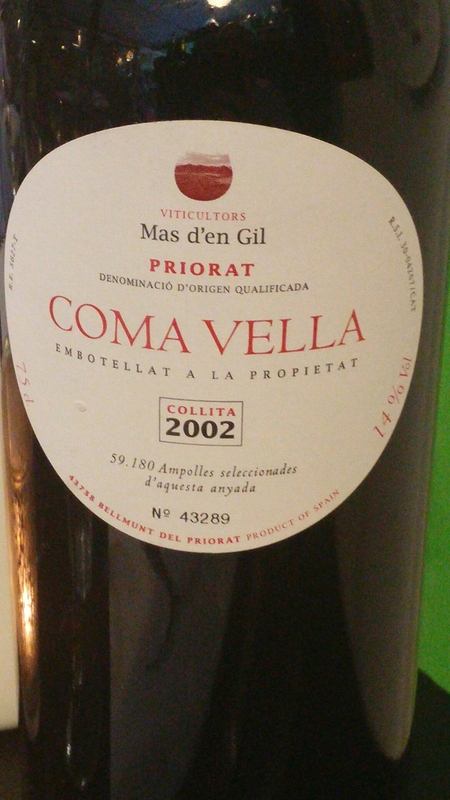 I decided to take one of my wines, in this case a rather nice Priorat wine, Mas D’Gill Como Vella, from Catalonia. This retails at Waitrose at around the £23.50 mark for a 2009 vintage (my bottle a bit more, due to it being a different vintage) but I picked up a full case of the stuff a few years back from a wine auction (Straker Chadwick in Abergavenny, where bargains can be had if you are very careful and lucky) for £120 (so a £10 bottle). 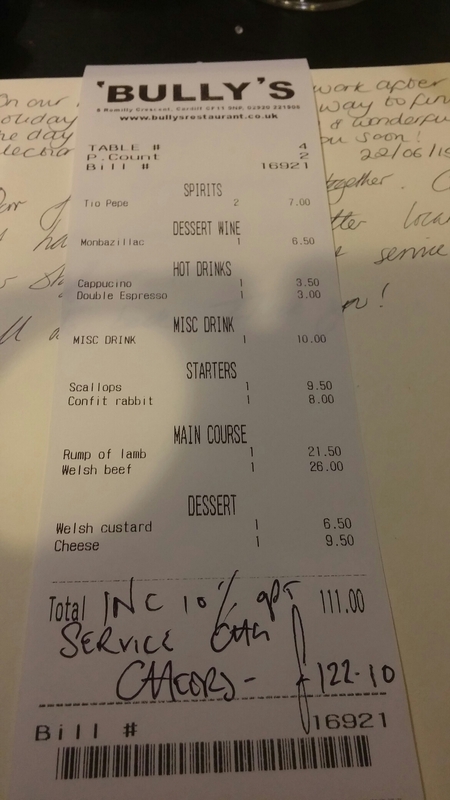 Even with a modest (by UK standards) 100% restaurant mark up on the retail price (say £23.50 – making the restaurant price £47 ) you would save yourself over £13 by bringing your own. Not bad, bearing in mind mark ups in UK restaurants are more often than not well pass the 100% mark. Would be lucky to find this wine on a restaurant list in the UK for less than £55, I would say. Anyhow, so to Bully’s itself. 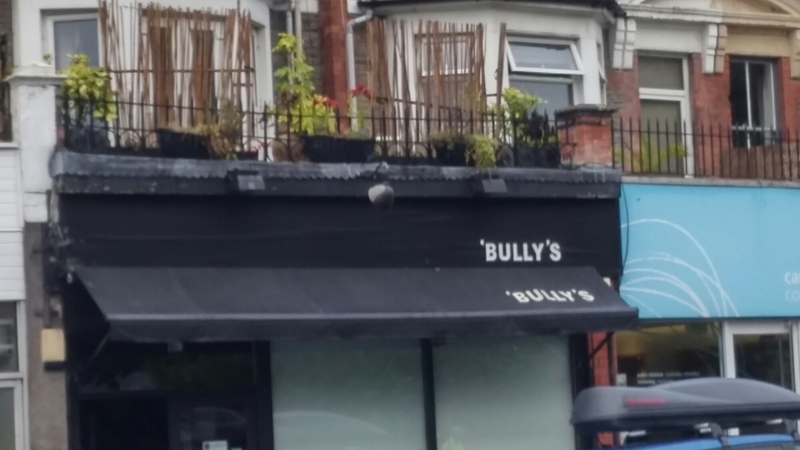 Located in the trendy Cardiff suburb of Pontcanna (if you are an Estate Agent or selling your house) or the ever so slightly less desirable Canton (if you are a Geography teacher), Bully’s is one of those much loved neighbourhood restaurants that has a loyal local following. Inside it has a very eclectic decor. 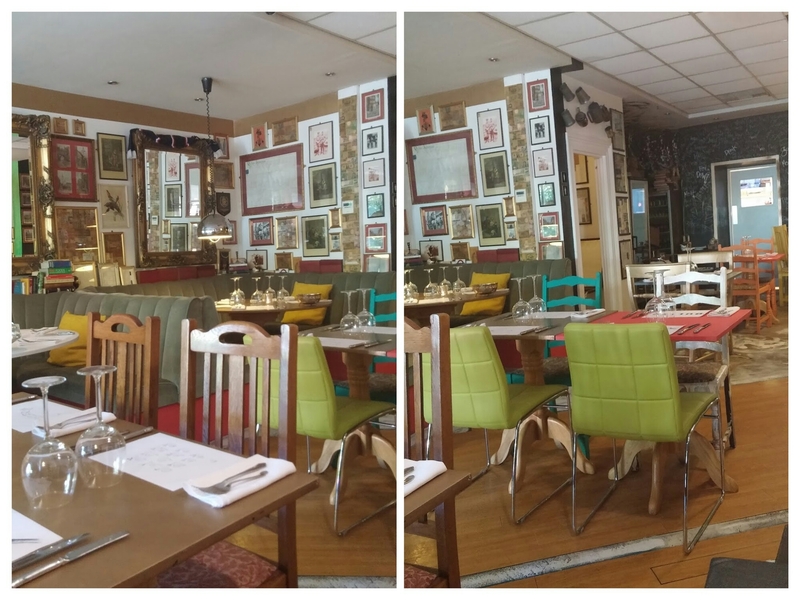 Lots of different types of chairs and mirrors and food paraphernalia on the walls. Even I, a lover of clutter (or as Mrs. SF would put it, a messy sod), thought the walls were a tad overfilled. 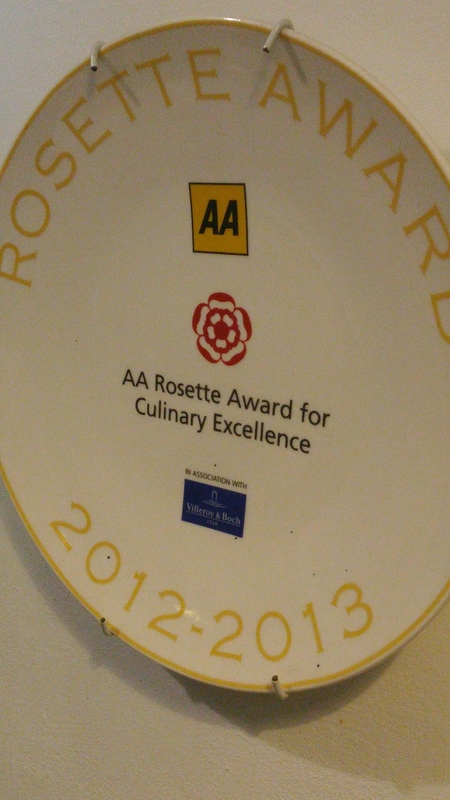 It was nice enough though, with plenty to distract the eye in the form of awards, menus etc. There are a couple of menus on offer in the evening including an early bird menu (available 18.30 til 19 30), (good value at £5 starter, £10 main and £5 dessert – choice bit limited though) and al a carte. 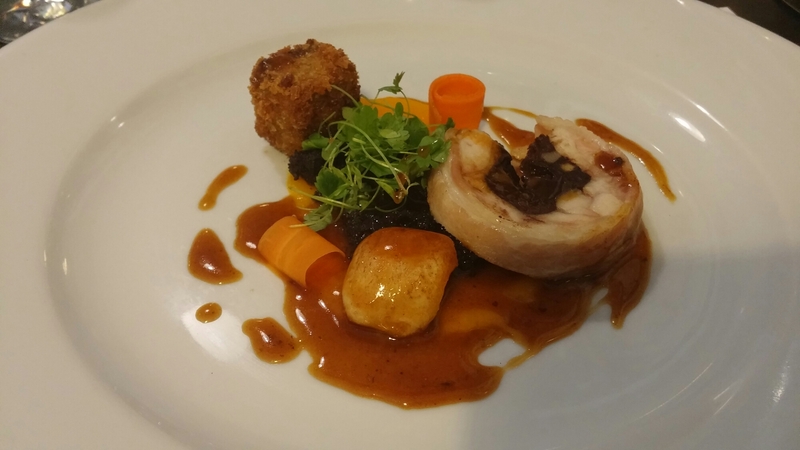 For my starter l went for the confit rabbit, with boudin noir, smoked bacon and pickled carrot (£8). This was a nice piece of cooking. The rabbit (lovely and moist) could so easily have been overpowered by the boudin noir and smoked bacon, but here more than held its own. The lightly pickled crunchy carrot acted as a nice counterpoint to the richness of the boudin noir. 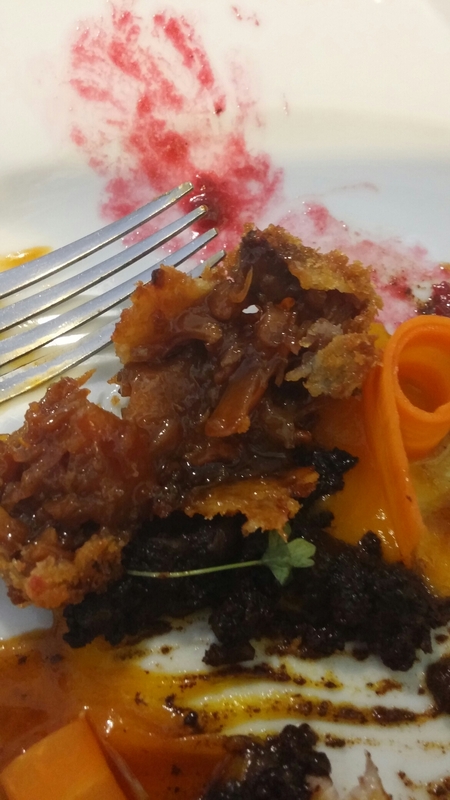 The star of the show was, however, the crispy deep fried cube of braised rabbit. Jam packed full of flavour, this was a real treat. This dish was great with the Priorat I bought. Mrs S.F. 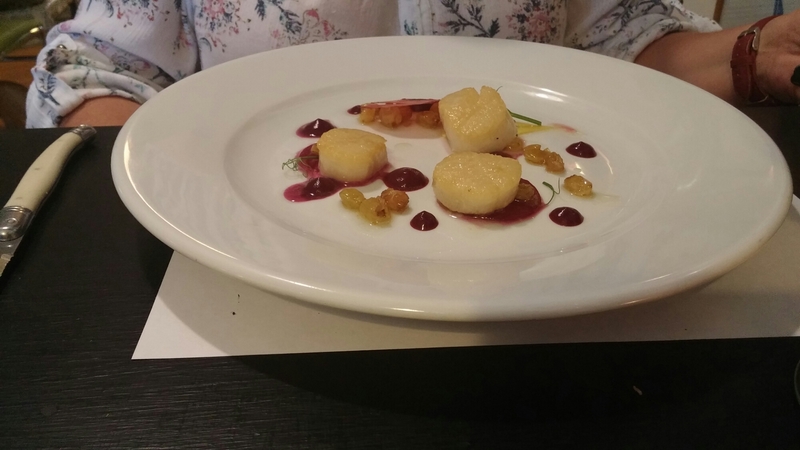 went for the scallops (£9.50) (she usually does when they feature on a menu), which came with an assiette of beetroot, sweet raisins and a sherry vinegar dressing. The sweet (not overcooked) scallops worked really well as against the earthiness of the beetroot (not thought of pairing these two, but it works really well) and the acidity of the sherry vinegar. Really good balanced dish this. My only slight criticism of this dish was a lack of caramelisation on the outside of the scallops, but this is a minor quibble. The Priorat not really being an option with the scallops, Mrs. SF drunk the Tio Pepe we had ordered as an aperitif with the scallops. It was a good match. On to the mains, Mrs. SF unusually went for the fillet of beef (£26) which is not something she normally orders, whereas I plumped for the lamb. 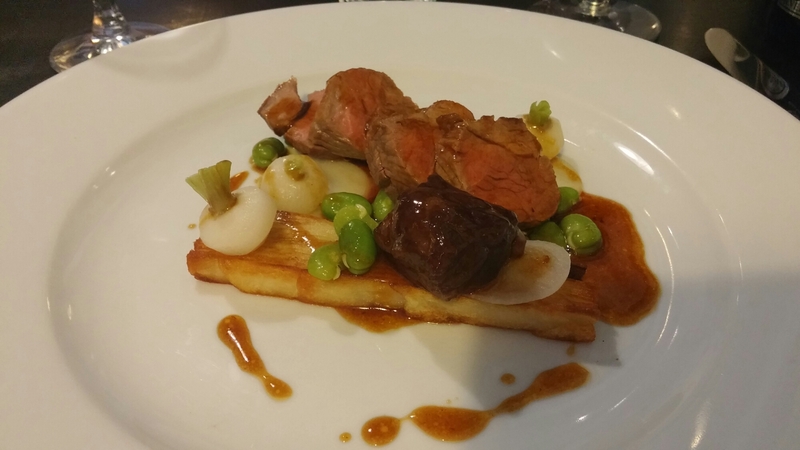 My lamb (£21.50) was billed as Welsh rump with braised neck, pomme Anna, Spring turnips and feves (broad beans). 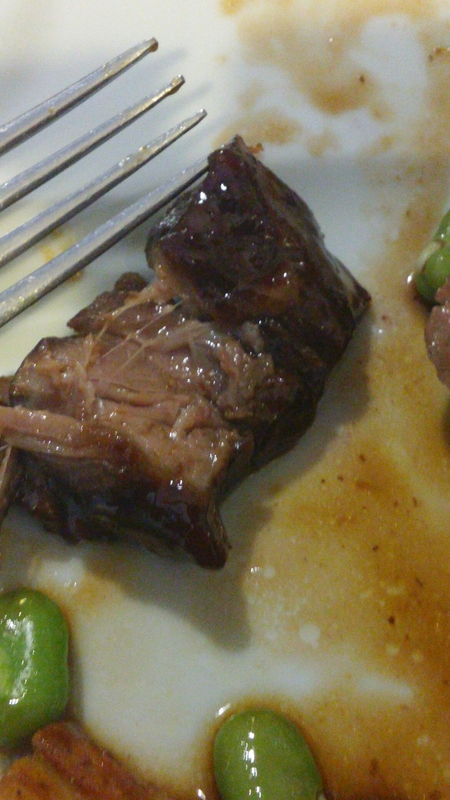 The rump was full of flavour and cooked pink, as requested, and the vegetables were exemplary (great baby turnips, lovely layered, crisply on the outside and buttery soft on the inside, pomme Anna and sweet broad beans). 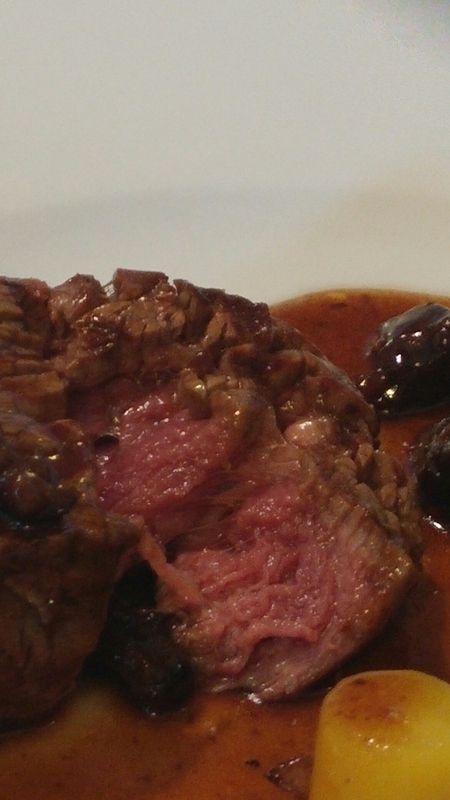 The accompanying sauce was excellent – reduced, so that there was a real intensity of flavour, but not overly so. Again the star was the cheaper cut element, with the slow cooked neck falling apart at the slightest nudge of my fork and bursting with lambiness. Fabulous. Mrs.SF’s steak was also very good, being full of flavour so often missing from a fillet. I often find fillet a bit boring (with flavour often sacrificed on the alter of tenderness) but from the piece Mrs. SF allowed me this was a really good piece of meat and cooked exactly as requested. 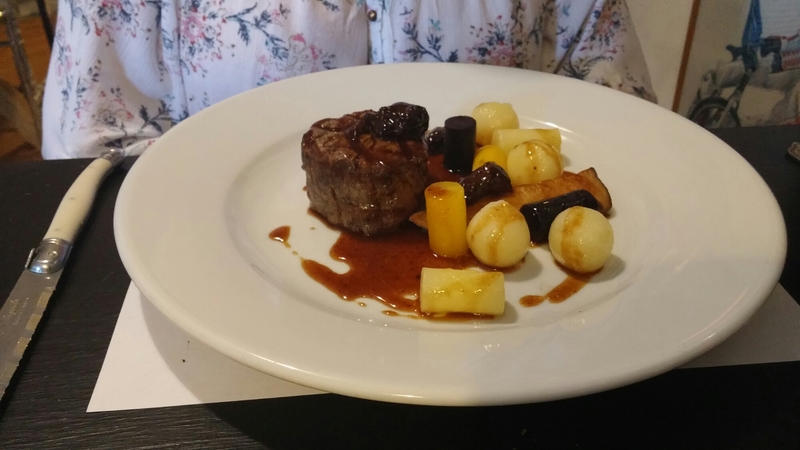 Mrs. SF said the accompaniments were equally good with some tasty oxtail (one of my favourite cuts of beef), lovely buttery confit potato, heritage carrots and a killer sauce. Worth every penny of the price was her view. Both dishes worked beautifully with the Priorat, for which I gave myself a pat on the back for bringing. On to the desserts, I was in a bit of a quandry as to what to go for as everything sounded good. The set welsh custard was akin to a creme brulee and none the worse for it. It worked well with the rhubarb surrounding it and also came with a rather good ginger tuile sort of thingie. 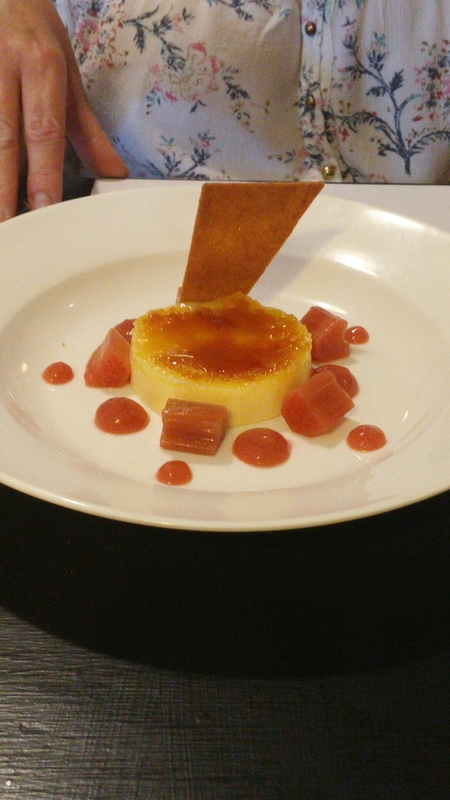 A nice desert with the (not too sharp) rhubarb stealing the show. Good wine pairing with it, of the not too sweet Monbazillac (£6.50). My cheese was to me a touch pricey at £9.50. 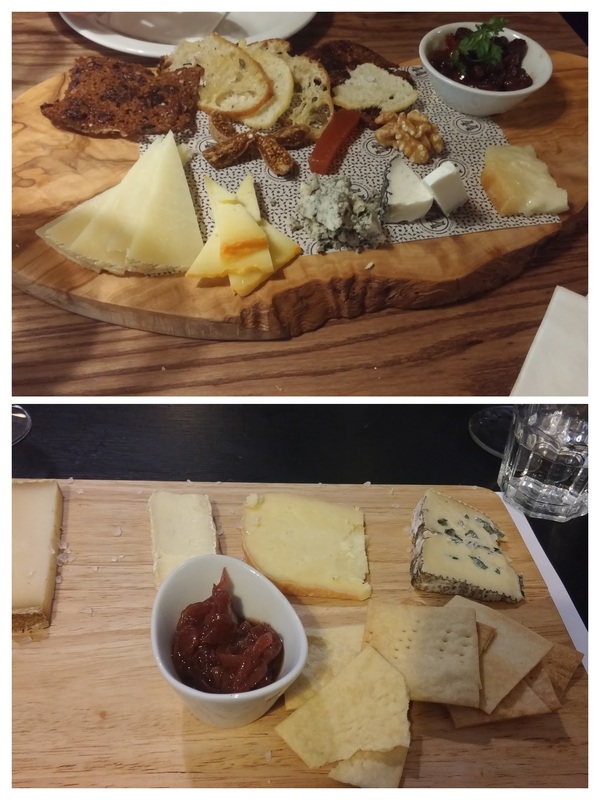 Whilst it was a reasonable size portion with 4 good cheeses, a nice chutney and enough crackers (so often not the case) it looked a little miserly compared to the cheese plate I had recently at Bar 44 which was only 25p more at £9.75. I did like the liberal scattering of nuggets of good quality salt over the cheese and the not too stingey cracker portion, but still think it was a bit too much at £9.50. Whilst I bought my own wine (and I heartily applaud Bully’s for their very reasonable £10 corkage charge), they have a pretty good (predominately French) wine list where the mark ups are not too excessive. For example , they have a Chateau Lacombe Noaillac 2009 on sale for £35, which retails around the £15 mark (so a £20 mark up – remember the only £10 corkage charge) and the Bel Olivier Sauvignon Blanc is on the list at £19 and retails at around the £9 mark. 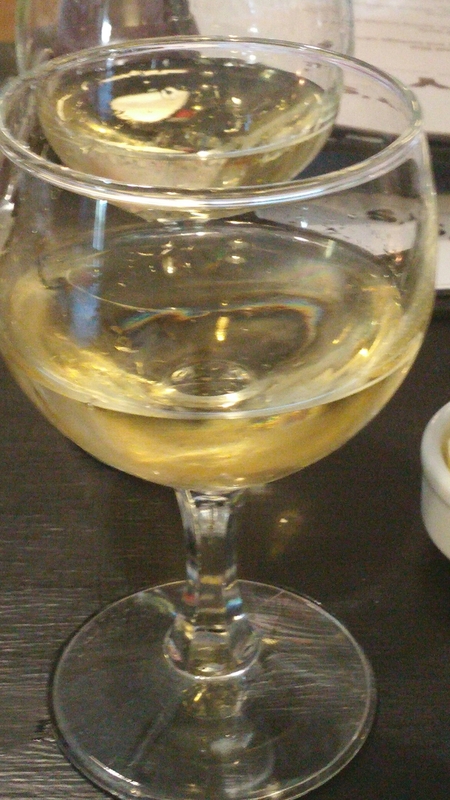 I also like the fact that they do a fair few wines by the glass and half bottle. So bring your own or drink their wine, it is all pretty good. 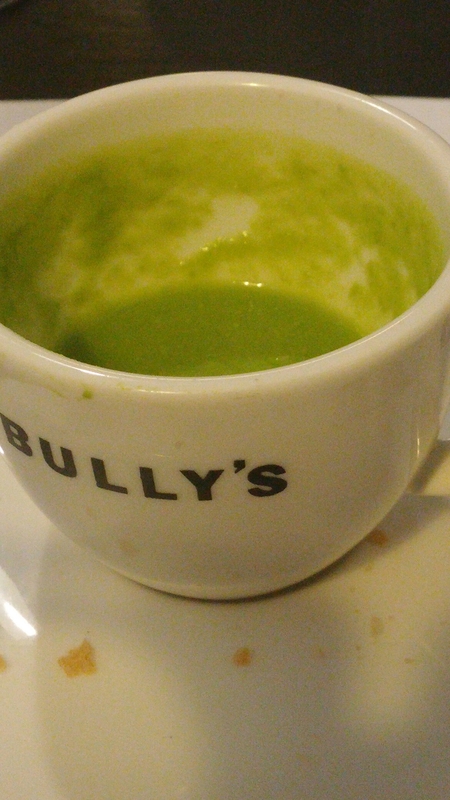 Both Mrs.SF and I thoroughly enjoyed our meal at Bully’s. Good ingredients cooked by a kitchen that knows what it is doing, I think sums up nicely what this place delivers. Service was good – knowledgeable but not obtrusive. The damage was just over £122 including the corkage charge, a couple of sherries, 3 courses each, a dessert wine and coffees. This figure also included the dreadful “discretionary service charge” – which annoys me no end. Here a tip was well deserved, but whacking it on the bill upfront makes it less than discretionary in my view as it is almost a challenge daring you not to be a “cheapskate”. They do in their defence warn you up front of this, but I still dislike this practice intensely. The overall price was not cheap I grant you, but I thought based on the quality of what we got not too bad value wise. 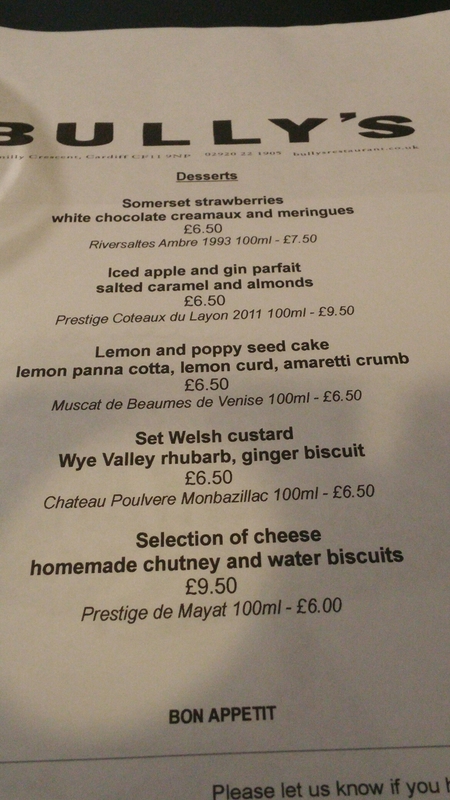 Some would perhaps argue it is a bit pricey for Cardiff, but I was overall (bar from the cheese and discretionary service charge) happy enough with the price. Cheaper options in terms of a fixed price lunch and early dining menus are on offer. J went a few weeks before mine and Mrs.SF’s visit and had the £70 for 2 people five course with wine lunch offer (available Monday to Saturday) and gave it a big thumbs up. Would I go back? Oh yes, am already looking at the dates for their Gourmet Nights (7 courses with good quality wine with each course for £75 per head). As the title of this post suggests, from that classic 80s darts based game show Bullseye, in my view in Cardiff you can’t beat a bit of Bully(s). 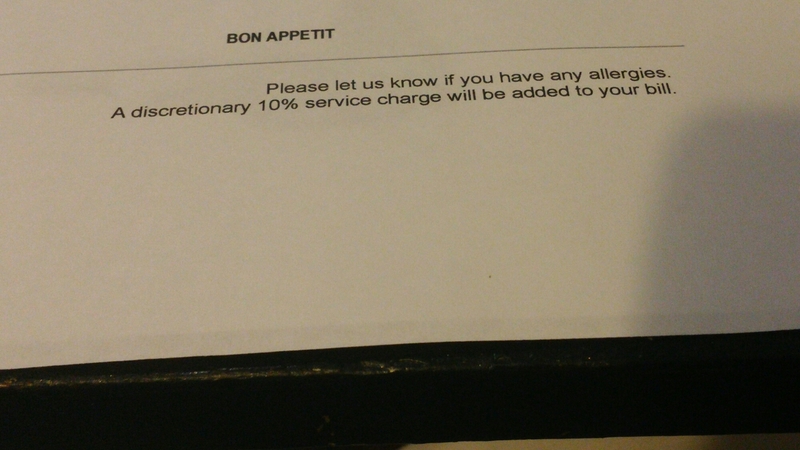 Would prefer it mind if they ditched the discretionary service charge (in its absence they certainly would have had a larger tip from me). 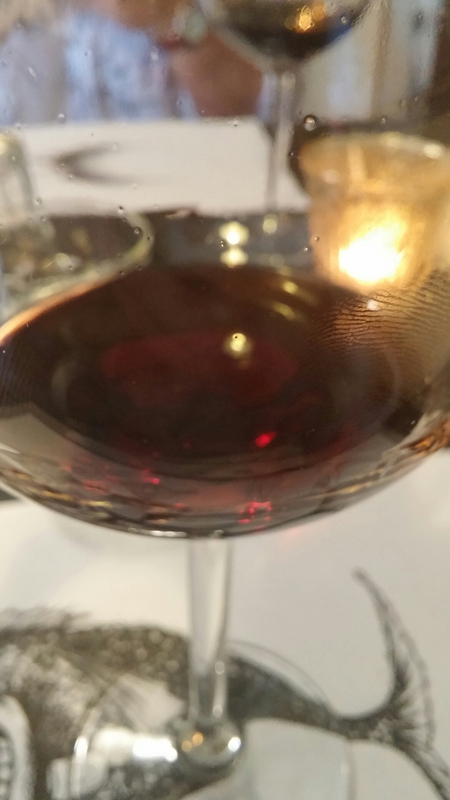 This entry was posted on Jul 19, 2015 by solicitingflavours in Alcoholic drink, Cardiff, cheese, corkage, Drink, early bird menu, Fine dining, Fixed Price Menu, Food, Food and wine products, France, French wine, lunch, Pontcanna, Priorat, Red Wine, Restaurant Review, review, Sherry, Spanish wine, sweet wine, Tasting menu, Wales, Welsh food, White wine, wine, wine mark up.